Stewart is the perfect example of a scholar warrior. He has dedicated his life to the study of Eastern religions as well as martial arts. His scholarly writings have made their mark in Eastern religious studies and his fluidity in Tai Chi Chuan has the signature of a master. 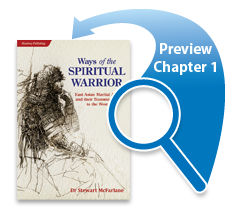 I highly recommend his book ‘Ways of the Spiritual Warrior’ that delves into the deeper layers of the martial arts that are often overlooked. Dr McFarlane has spent over thirty-five years researching and training in martial arts. These four scholarly papers represent some of the results of his research findings and experiences. The first two papers begin by addressing the roles of traditional Asian martial arts in their original contexts, as forms of ritualised control of violence, as ways of disciplining and training young men, and as means of cultural and ethnic identity and as means of ritual control of space and territory, and even as forms of exorcism, and entertaining the gods. These papers then go on to discuss the fascination which Asian Martial Arts hold for many Westerners, either as forms of entertainment through movies and other media, or as committed lifestyle choices, involving years of disciplined training and engagement with a foreign culture and language, and often embracing a radically different way of seeing life and one’s place in it. He is particularly interested in martial arts seen a spiritual discipline or moving meditation, and in those who pursue them as a form of personal development, growth or spiritual transformation. Dr McFarlane introduces the notion of ‘cultural distancing’; where the level of engagement with an Eastern martial art as a spiritual practice or a means of personal transformation; is often accompanied by a distancing or sense of alienation from ‘mainstream Western culture’. The third paper, “Bodily Awareness in the Wing Chun System“, looks at a specific Chinese martial art, and how concepts derived from the Chinese Taoist and Buddhist milieu in which it developed, provides an effective means of integrating mind and body and understanding their functioning in practical terms, producing a highly sophisticated and effective martial art. Those who have read Dr McFarlane’s book, “T’ai chi ch’uan: Wisdom in Action in a Chinese Martial Art“, will recognise that Wing Chun and T’ai chi shares the same underlying dynamics and the understanding of reflex sensitivity skills, as well as the ‘holistic’ understanding of mind-body integration, is apparent in both these systems. If you have ever wondered why so many Asian Martial Arts are so closely related to the usually peaceful religion of Buddhism; then the fourth paper, “Fighting Bodhisttavas and Inner Warriors. Buddhism and the martial traditions of China & Japan” helps to answer that question. It is the most detailed in terms of textual and cultural analysis. It looks at specific stories from the martial ‘myths of origins’ as well as the Sino-Japanese Buddhist texts, and from secular literature, to establish the multifaceted associations between Buddhism and martial arts in China and Japan. Textual and literary examples are cited to illustrate all of these themes, and the final theme is largely addressed by material from Dr McFarlane’s fieldwork in Taiwan with ritual troupes. These troupes train in traditional southern Chinese style martial arts and weapons systems. They employ them in the ritual protection of communities and temples and specifically to perform exorcisms and drive out malevolent spiritual forces, and encourage the attendance of the beneficial gods, at important community festivals. Considerable discussion is focused on these troupes, because the magical dimensions of both Buddhism and East Asian martial arts are often ignored in Western discussions. The troupes preserve some very traditional forms and styles of Chinese martial arts, as well as illustrating how ritualized martial arts have helped to re-enforce cohesion and solidarity in local Taiwanese communities. Dr McFarlane shows that martial arts can be as much about spiritual power and ritual effectiveness, as about technical proficiency or fighting skill. The purpose of the papers in this book are to inform readers who are interested in martial arts, both as cultural expressions in traditional Asian contexts and in the West, as well as those interested in them as practical ways of training and developing mind-body skills. They form a fascinating collection and a rich source of information and insights into the real nature of Asian martial arts. Serious students of martial arts will have their understanding deepened and stimulated by this collection of papers.